Stand your plates on edge and for quick grabbing rather than stacking them inside a cabinet. 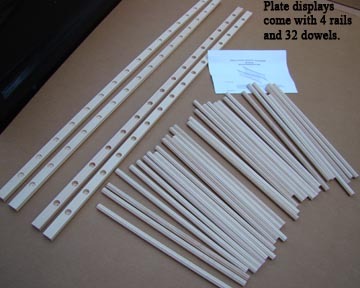 Plate Displays packaged as a kit, unassembled, can be cut to length. Fine sanded and ready for you to finish. Top and bottom rails are 34-3/8" long. Beaded dowels are 12" tall. Top and bottom rails are drilled 2" on center. 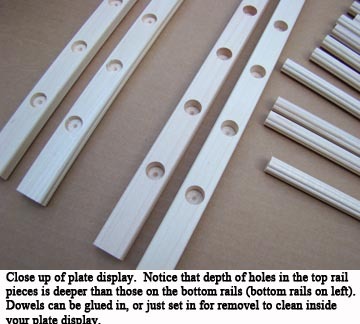 Each kit contains 2 pre-drilled top rails, 2 pre-drilled bottom rails, and 32 beaded dowels. Complete front and back. Maple, Oak, and Cherry plate displays ARE STOCKED and can ship right away. Hickory is ordered as requested. General lead time on hickory is 10 to 15 business days for us to receive it. Direct ships are possible.